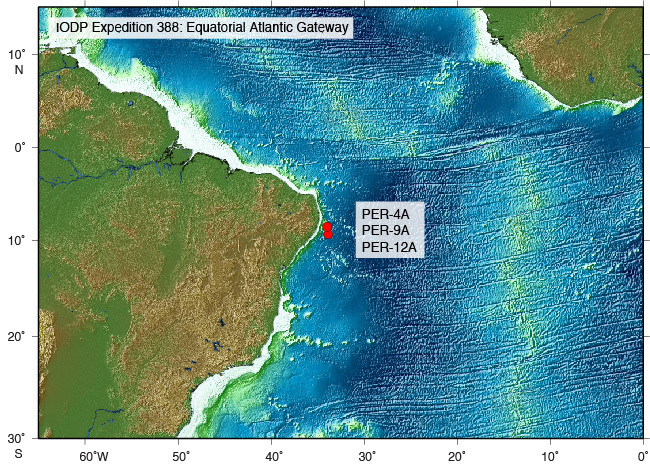 Expedition 388 will study the tectonic, climatic, and biotic evolution of the Equatorial Atlantic Gateway (EAG) at three sites on and near the Pernambuco Plateau (northeastern Brazilian continental shelf). These will target Late Cretaceous-Recent sediments and oceanic crust and are strategically located both near the continental margin and at paleo-water depths that are shallow enough (< 2000 m) to provide well-preserved organic biomarkers and calcareous microfossils for proxy reconstructions of greenhouse climates. Core and log data will address four key themes: (1) the early rift history of the Equatorial Atlantic; (2) the biogeochemistry of the restricted Equatorial Atlantic; (3) the long-term paleoceanography of the EAG; and, (4) the limits of tropical climates and ecosystems under conditions of extreme warmth. This expedition will constrain the long-term interactions between tectonics, oceanography, ocean biogeochemistry and climate, and the functioning of tropical ecosystems and climate during intervals of extreme warmth.